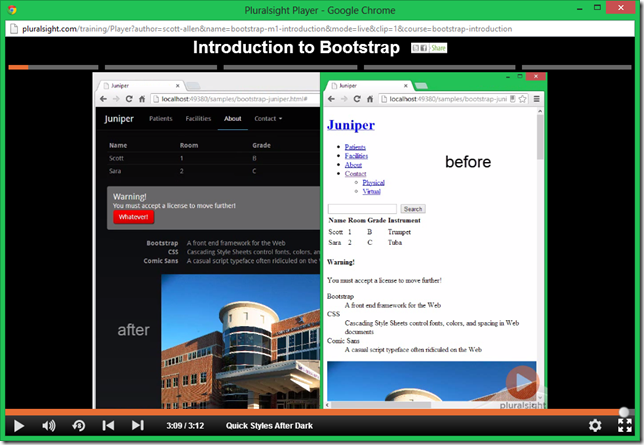 I have a new set of videos on Pluralsight covering the Twitter Bootstrap framework. If there is enough interest, I was thinking of a future set of videos showing how to use Bootstrap's LESS files with a server framework like ASP.NET MVC. As a Pluralsight subscriber I will be watching your course in the very near future. Also, put me down as one of those interested in learning to Bootstrap an MVC application. I recently took the time to figure out how to get my MVC4 site to work with the Bootstrap LESS files along with the LESS files that come with a Bootswatch.com theme. I'm using the build-time LESS compiler that comes with WebEssentials rather than compiling it at run-time. I am watching your Bootstrap course on Pluralsight now and can say, not only is it very clear and helpful, I wish I had something like this when I was figuring out how to get the LESS files to work. I'm sure it would have gone much faster. I definitely vote for the course! Watched the videos, it was a thorough overview. As the title suggests, they are an introduction, so anyone familiar with Bootstrap should probably cherry-pick the sections that look interesting. For a newcomer, this is bread and butter content. I would also like to see how you tie this in with something like ASP.NET MVC. At my day job, I've used bootstrap with Less on a couple of internal intranet MVC sites and the odds are really good that we'll do the same thing on the next public facing project we have. Scott, You absolutely have to keep going with this. There is a desperate need within the .NET development community to be able to accurately navigate the plethora of open source libraries and frameworks out there. CSS and web design is one area that developers tend to need a lot of help with, so please keep your quality training coming and put me down as an interested party for the next Bootstrap course. Watched your video and it convinced me to use Bootstrap for our new project. +1 on the Bootstrap + MVC4 video proposal! +1 on the Bootstrap + MVC 4 course.